A free prom event dedicated to celebrating teens and young adults affected by disability. What is An Evening to Treasure? An Evening to Treasure is a free prom event for those affected by disabilities between the age of 15 and 21. Each of our Honored Guests receive a free prom dress or tuxedo in the weeks prior to the event. At the prom, we partner each Honored Guest with a mainstream Host of similar age to ensure their fun and safety throughout the evening. During the prom, each Guest gets their hair and makeup done by professional stylists, a tiara or crown, shoe shine, a corsage or boutonniere, formal photo, limo ride, a walk down the red carpet and celebrity wall, and of course, the dance. Inside, a live DJ provides music for everyone while Chick-fil-a provides dinner. While this is all happening, the parents are in a different building, also being cared for and fed by volunteers who understand the challenges of disabilities and special needs children. At the end of the evening, our Honored Guests go home with a Treasure Bag full of prizes, gift cards, and the formal photo they took earlier in the night. Since all of this is free to the participants, it truly is An Evening to Treasure! 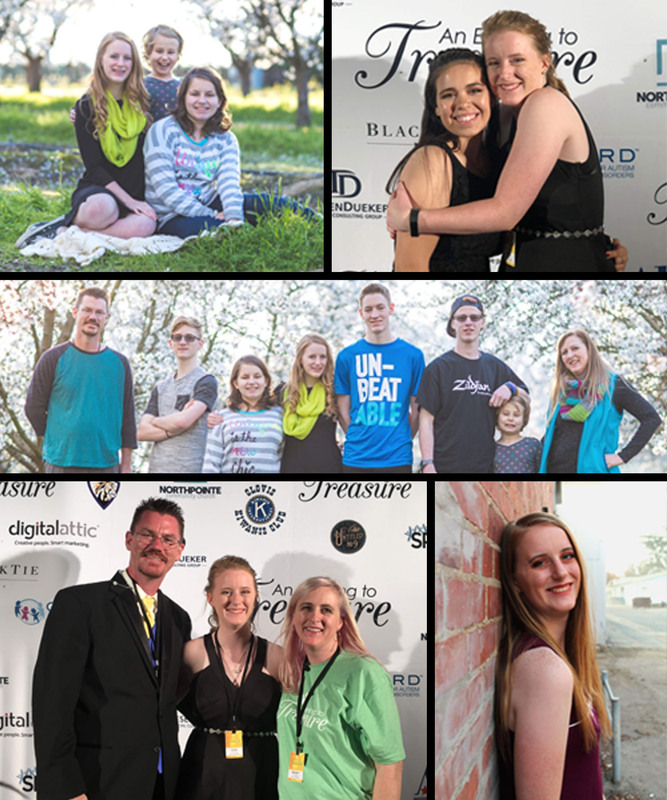 An Evening to Treasure began with the dream of Tiana, a 17-year-old girl who one day realized that prom may be something her little sisters may never experience just because of their disabilities. Her sisters each have different obstacles they face each day from neurologic to physical challenges and yet why should they miss out on being celebrated for who they are? As she pondered these thoughts, she was inspired to figure out how to make something like this a reality for everyone, regardless of ability or disability. That dream became a reality when she collaborated with a team for her Senior Legacy Experience (SLE) at her school, Minarets Charter High School. Not only did Tiana’s event make a great impression on the school, An Evening to Treasure now operates every year as she desires to create lasting memories for those with able and disabled bodies alike through a new 501(c)3 organization. Honored Guests are students ages 15-21 with special needs. Our Honored Guests will be pampered throughout the night with an unforgettable prom experience! Student Hosts are mainstreamed students, ages 15-25. Our Student Hosts will be paired with Honored Guests for the entire night, making sure to give them the night of their life! Adult Volunteers are individuals 18+ that will be working alongside our Student Hosts and Honored Guests at each station provided by making sure that everything runs smoothly. We desire to give each guest the special treatment they deserve! Each Honored Guest will be pampered from head to toe with everything you could imagine at prom! Prom dresses are provided free of charge from Dream Dress Assistance League of Fresno for all of our female guests! Tuxedos are fitted and tailored to each male guest free of charge by Black Tie and Bridal Lace! Each Honored Guest is paired with a trained Student Host to help guide them through the night and make sure that they have the best possible experience! After family members have dropped off their Honored Guest, they can then head over to the Family Area for a free meal and fellowship with other families affected by disability. After saying goodbye to their families for the evening, our female guests will head over to get their makeup done by some of our volunteer professionals! Every Honored Guest will get to choose from a variety of suggested hair style options, provided by our professional hair stylists! Next, all of our female guests will get to pick from an array of donated jewelry to match their dress! All Honored Guests will recieve a crown or tiara of their choice to remind them that they are seen as kings and queens in the kingdom of God, no matter what their disability! Every one of our male guests will get a shoe shine to make sure that they are looking sharp for the dance! Corsages and Boutonnieres are given to each guest and are donated and constructed by Caruthers FFA students! Every Honored Guest and Student Host will take a professional photo, which will be sent digitally to parents for them to print out and share as they wish! After taking photos, everyone will get the chance to take a ride in a limo! After arriving to the dance in style, our guests will walk the red carpet, greeted by our cheering paparazzi, where they are reminded that they are loved and valued. But don't worry! If your guest is noise sensitive, our paparazzi will celebrate them with just as much excitement as everyone else––in sign language! On the red carpet, we provide a step-and-repeat wall with all of our largest sponsors printed on the wall for all of our guests and hosts to have a photo taken of them in front of, just like all of the big celebrities do! After receiving all of our provided services, the dance will begin and everyone can dance the night away. They will get the experience of a lifetime and make memories and friendships that will last a lifetime! During the dance, Honored Guests and Student Hosts are provide with free a Chick-Fil-A meal for dinner, along with dessert and several alternate options for those with special dietary needs. In the dance, photo booths are setup for old and new friends to take photos to remember the special night! At the end of the night, before parents reunite with their guests, each Honored Guest receives a Treasure Bag filled with coupons, swag, a shirt and other gifts from the community. If you would like to donate one or more of these items, please get in contact with a staff member on the Donate page. Copyright © 2019 An Evening to Treasure. All rights reserved.